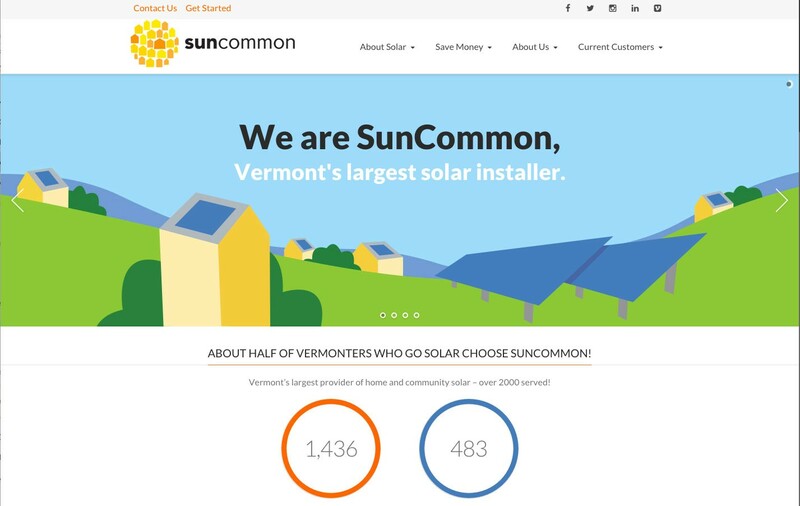 SunCommon is a very young and successful solar energy equipment installer in Vermont. I had the pleasure of designing their first website in 2011 when they first hit the ground running. Many installations, media kudos, and employees later, they had outgrown that site and were ready for the next phase. This new WordPress theme is responsive, wall-to-wall, and offers much more appeal and navigation menu configurations. They have great photography, and after 4+ years, a virtual mega library of success stories, testimonials, and knowledge based for any newcomer interested in their services. With their sign up form also sent to the next level of complexity, they were also able to keep the friendly illustrative nature of the brand, and we capitalized on it with the movement the theme offered.